Hydraulic Fracturing, also known as hydrofracking or fracking, has provided a safe extraction of oil and natural gas from underground shale formation for over sixty years. The continuous improvement of technology allows more access to abundant energy sources while reducing environmental impact. The process involves drilling a borehole into the earth up to approximately 7, 700 feet deep or 1.5 miles below. Safety is a top priority and precautionary measures are in place surrounding the borehole, such as multiple layers of protective steel casing and additional cement casing. Preserving the water quality in the aquifer is the first priority in the fracking process, and part of this job is performed by hydraulic fracturing liners employed in collection frac pits, in frac pads and in various other uses, forming layers of separation and protection between groundwater and potential contaminants. Water quality is principally addressed by placing an additional steel and cement casing around the borehole. 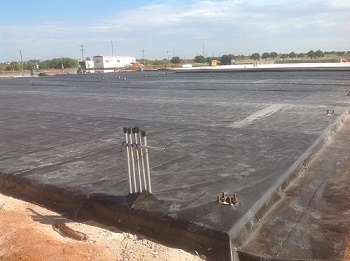 Once the layer of casing is in place, it is pressure tested to make sure that no hydrocarbons and other chemical substances can seep into the groundwater level. As the borehole is drilled into the ground, it passes through many layers of earth and several rock layers such as granite that are extremely dense and are not affected during the fracking process. On top of the steel casing and cement casing, the density of those layers also acts as natural barriers between the shale layer, where the extraction occurs and the ground water level to prevent any chemicals or natural gas from seeping into the aquifer. About 500 ft. above the shale layer formation, a specific instrument then begins the angled drilling to create a horizontal path and penetrate the targeted layers of gas or oil bearing shale. Once the horizontal distance is achieved, the casing and cementing process continues to the entire length of the wellbore. A perforating tool is then inserted into the well, creating fractures in the shale layer, allowing hydrocarbons to enter the well stream. When the perforating tool is removed, fracturing fluid made up of mostly water, some sand and less than one percent additives is pumped into the well, opening tiny fractures deep into the shale. Bridge plug is inserted and the fracturing process repeats across the entire length of the well. Once all the fractures are completed, the plugs are removed and gas can flow to the surface. The water mixture, also called the flowback, is then extracted and stored in a reservoir or frac pit. When the water is removed the sand is left behind which holds the fractures or fissures open and makes it easier for gas to travel from the shale, out into the well. The water is collected in reservoirs or lined frac pits then pumped into container trucks and transported away from the fracking site.